CANDLEMASS - EPICUS DOOMICUS METALLICUS LIVE AT ROADBURN 2011 VINYL (2LP) | Online Shop | Wizard LTD. Album: "EPICUS DOOMICUS METALLICUS LIVE AT ROADBURN 2011 VINYL (2LP)"
CANDLEMASS' debut LP, "Epicus Doomicus Metallicus", is a genre-defining classic if there ever was one — the starting point of modern epic doom metal, even. 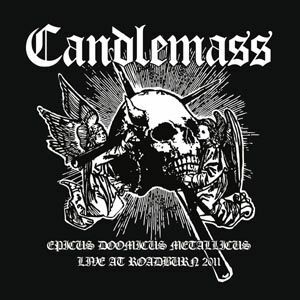 In 2010 and 2011, CANDLEMASS invited the original "Epicus" vocalist Johan Langqvist back into the fold for a few select shows celebrating the album's 25th birthday. This vinyl-only release captures the band performing "Epicus Doomicus Metallicus" album live at the sold-out Roadburn festival in Holland in April 2011. Mixed from a professional 32-track recording and mastered vinyl under the supervision of band founder/mainman Leif Edling, this is the ultimate live version of the classic.